Repair damaged or corrupt PST files without any hassles. Quickly repairs corrupt/damaged PST files and restores the data in a newly created PST file. Enables saving the recovered data in EML, MSG, RTF, HTML and PDF formats. Supports repairing of encrypted/password-protected PST files as well. Exports repaired PST file in Office 365 format. Repairs corrupt PST and restores all email items into a new PST file. Supports MS Outlook 2016, 2013, 2010, 2007, 2003, 2002 &amp; 2000. The software has been loaded with many features that make your life easier and takes you out from the tension of losing important emails, contacts, and other data like attachments. Owing to its robust algorithm, our Outlook PST repair tool carries out in-depth scans of the irreparable PST file and searches for the data that can be recovered. It then recovers all the mailbox components within the PST and restores the same into a new and usable PST file. We often come across a situation, where we require an email component after we have deleted it. Outlook PST repair serves this purpose with utmost ease. You can recover the deleted emails which were long ago deleted from the “Deleted Items” folder of your Outlook mailbox easily. This feature is handy when any important email or attachment gets deleted or is lost. This PST repair software allows you to search, view and save only the required messages from a damaged PST file. Its ‘Find Message’ feature allows its user to take hold of a particular email and save it in required format like EML, MSG, RTF, HTML or PDF. Outlook PST repair tool is capable of repairing heavy PST files without any delays, irrespective of the level of damage caused to the file. This tool can smoothly repair files as big as 2GB in size. Often users are unaware of the exact location where the PST is saved on their computers. This software enables you to search for the required PST file with its ‘Find’ option. You can select the PST file that you wish to perform repair and recovery on, and Outlook PST repair tool will help you do so quickly. Many Outlook users encrypt their PSTs as they work on confidential information and they wish to safeguard their data. However, once they get damaged, it becomes difficult to recover their data as it is password-protected. But not with Outlook repair tool, it prompts its user to enter the password to decrypt the PST and then repairs it thoroughly. Outlook PST repair software allows you to save the newly created PST file at a desired location including on a shared network or any external hard disk. 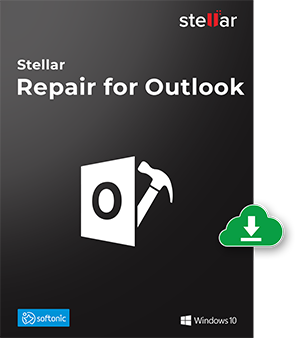 Outlook PST repair software allows the users to preview recovery items before saving them. This feature allows its user to preview email components like calendar, tasks, journals, contacts etc before saving them. Also, post ensuring that a particular set of data is to be saved, user can save it in desired format i.e. MSG, EML, RTF, HTML, and PDF. Post the PST scan, users can arrange the scanned emails listed in the tree-view format. The tool allows you to arrange the emails basis different criteria such as 'Date', ‘From’, 'To’, 'Subject', 'Type', 'Attachment', and 'Importance'.